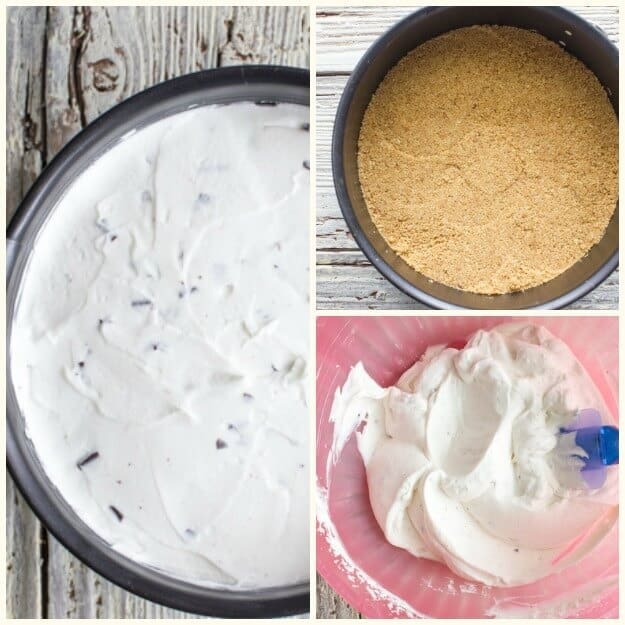 Frozen Yogurt Cake, a delicious healthy alternative to Ice Cream. Made with Creamy Greek Yogurt and dark chocolate chips. 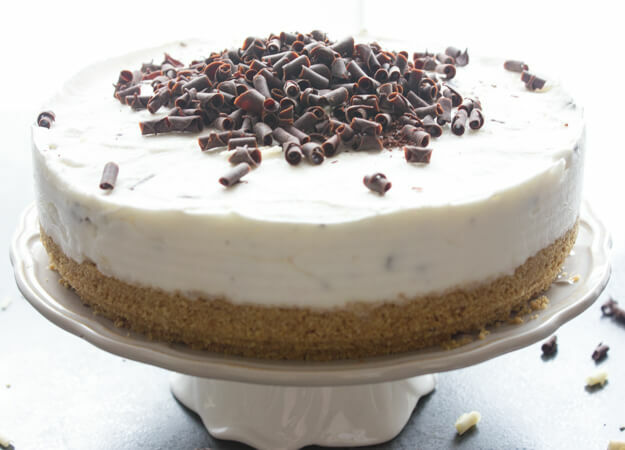 Chocolate Chip Frozen Yogurt Cake, the perfect Summertime Dessert. I am not a plain Yogurt lover, I do not like to eat yogurt straight out of the container, unlike the other members of my family who all love it. Although I really wish I did like it, it’s one of those healthy grab out of the fridge kind of snacks. Therefore it’s a good thing I like to bake with it, it’s amazing what you can make with some Greek yogurt. We all love this absolutely delicious, fast and Easy Yogurt Cake, and this amazing No-Bake Berry Greek Yogurt Cake went over really well. And now I can freeze it and make this yummy Chocolate Chip Frozen Yogurt Cake. Sometimes I will think (not very often though)! “Oh no enough with Ice Cream let’s try something different craze” but I really really want the creaminess of ice cream, but not so much the calories, so I usually go for a frozen yogurt. I always loved a good Frozen Yogurt in Canada. So I thought why not try making a Frozen Yogurt Cake, my husband loved the idea and my daughter decided that we needed to try a chocolate one. I have never seen chocolate yogurt in the grocery store here, but she assured me it was there. So instead I decided on Chocolate Chip Greek Yogurt. I added a few more chocolate chips, just because, some cream and of course I made a graham cracker crust base. To tell the truth you cannot buy graham crackers in Italy, so a great alternative is crushed Digestive Cookies, you may want to give that a try because believe me it is really good, I prefer it to a graham crust. 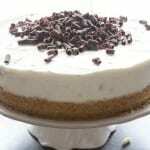 Chocolate Chip Frozen Yogurt Cake, a healthy delicious no-bake Summer dessert recipe,made with a Graham Crust & Greek Yogurt. Place a glass bowl and beaters in the freezer for approximately 20 minutes before beating the cream. 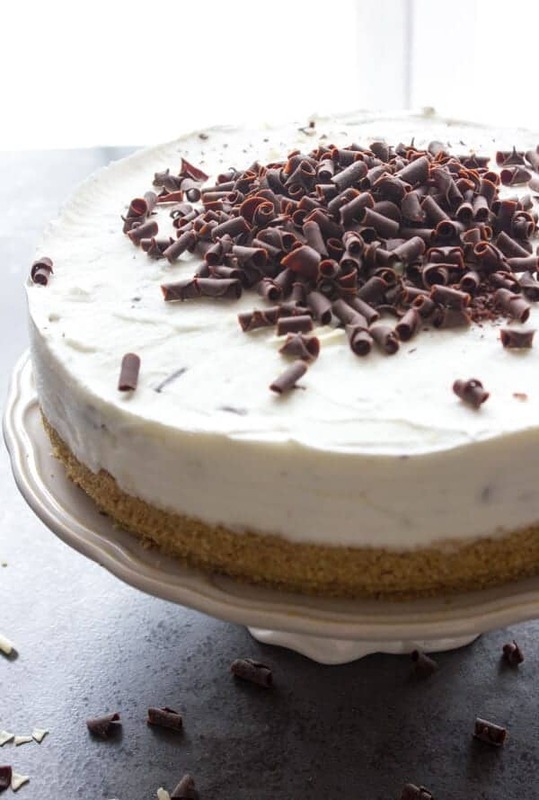 Mix graham cracker / cookie crumbs and melted butter, press down on the bottom of a 7 - 8 inch (17 - 20 centimeter) springform cake pan (or line a regular cake pan with plastic wrap). Place in refrigerator. Beat cream and sugar until stiff, fold in yogurt and mini chocolate chips, remove cookie base from the fridge, spoon yogurt mixture onto base, cover with plastic and freeze for approximately 3 - 4 hours until firm. Let sit 10 minutes if very firm, sprinkle with chocolate chips or chocolate curls, cut and enjoy! 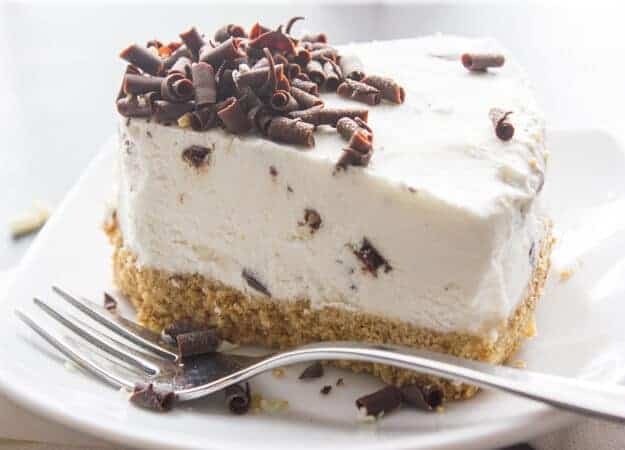 So if you are looking for a yummy Summer Dinner Dessert or an Afternoon get together and you want something other than an Ice Cream or a No-Bake Dessert I think you will find this easy Chocolate Chip Frozen Yogurt Cake the perfect choice. Enjoy! This sounds and looks perfectly delicious. I love the healthier take on it too! I’m not one for eating yogurt straight up either, so this is a nice alternative. Thanks Olivia, frozen yogurt is pretty delicious. I am a yogurt lover but eating it as a dessert – WOW! It sounds and looks delicious. A very good way to get your good bacteria! Great recipe!